Louis wakes up before his daddy, rolling out of bed and tip toeing down stairs. He drags a chair over so he can climb onto the counter, Ted sat there too. He rolls up his sleeves and opens the fridge, grabbing some eggs and flour. "Daddy is going to love his surprise, Ted," Louis whispers and starts cracking the eggs and sprinkling flour into the pan. He makes sure it&apos;s hot and starts stirring it. "Toast," he mumbles and slides four pieces of toast into the toaster. "Smoothie, daddy likes smoothies," Louis mutters and drags out the blender, filling it with fruit. He switches it on and gasps when he, the walls and Ted all get splattered with purple. "Daddy&apos;s coming!" Louis panics and tries to climb down but he slips and his hand lands in the hot pan. If the blender didn&apos;t worry Harry, Louis&apos; loud cries certainly did. The kitchen is a mess. Louis spilt milk for the smoothie on the floor, cracked eggs on the side, redecorated with strawberry and blueberry smoothie. "Louis Tomlinson what on earth do you think you&apos;re doing?" Harry reprimands as he turns the oven off. The toast pings up black and smelly. "I tried to make daddy surprise breakfast but I hurt my hand!" Louis sobs. Harry is immediately distracted by his hurt hand. He kneels beside him, holding his wrist gently so he can see. "Oh baby, how? Did you touch the oven?" Harry asks as he picks Louis up. Louis nods, chest heaving with his cries and nose running. "I want you to sit and stay here while daddy tidies the mess up." 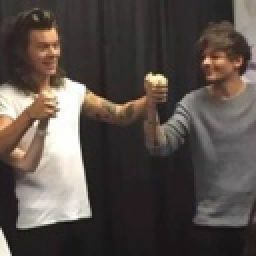 He switches the tap on and holds Louis&apos; hand under it. "Thank you for trying to make daddy breakfast," Harry says gently once he&apos;s tidied up. "How about we make pancakes and smoothies together once we&apos;ve got your hand fixed up?" "Okay daddy," Louis sniffles, hugging Harry tight. "I&apos;m sorry for making a mess." "It&apos;s okay baby, you didn&apos;t mean it." He slathers burn cream over Louis&apos; palm and fingers before wrapping it in a gauze. "If that is still really hurting later we&apos;ll go to the doctors, okay?" Harry says as he feeds Louis some medicine to help with the pain. "Okay, daddy. Pancakes now?" Louis asks. Harry chuckles. Harry puts music on his phone, dancing around as he goes to the fridge and back to the oven. Louis giggles and dances too. He grins as his daddy leans down to kiss him, whining when he pulls away. "Sorry, baby. Once the pancakes are done you can have as many kisses as you like," Harry smiles, ruffling Louis&apos; hair. "Okay, daddy. We still make smoothies?" "Yes. What would you like in the smoothies?" Harry asks as he tips the pancake onto the plate and starts another one. "That sounds lovely, sweetheart," Harry smiles, dipping down to kiss Louis. Louis beams at the praise. They sit at the table, Harry lifting Louis up to sit on the stool. Louis thanks his daddy happily as he starts to eat his pancakes. "These are lovely, daddy. 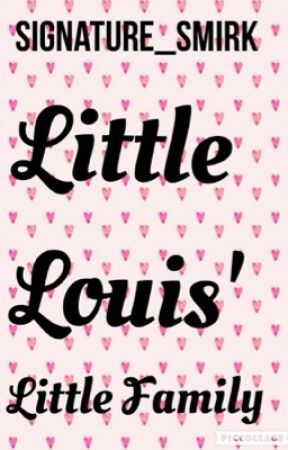 Thank you," Louis smiles. "Good. We can watch home if you want to?" Harry suggests, watching Louis excitedly try his smoothie. "The alien one?" Louis asks. "Yeah, the alien one, love." Harry brings their smoothies into the living room with them and wraps them up in a blanket as they watch home. Louis rests his head in his daddy&apos;s lap and cuddles Ted to his chest as they watch the film, Harry running his finger through Louis&apos; hair. "So beautiful, baby, daddy loves you so much," Harry murmurs lovingly. Louis turns to stare up at him, smiling softly. They grin at each other for a couple moments before Harry dips down to kiss Louis quickly. Louis giggles when Harry repeatedly kisses his neck. "That tickles, daddy!" Louis laughs, holding Harry&apos;s head. Harry chuckles. "C&apos;mon, bubs, let&apos;s watch the film."